WASHINGTON — The United States called Friday for a war crimes investigation of Russia and Syria, ramping up the rhetoric against Moscow for its part in a deadly military offensive in Aleppo while potentially making it harder to restart diplomatic efforts to end the conflict. Secretary of State John Kerry said Syrian forces hit a hospital overnight, killing 20 people and wounding 100, describing what would be the latest strike by Russia or its ally in Damascus on a civilian target. A spokesman said the attack occurred Thursday outside Damascus, while human rights group accuse the pair of killing thousands in their assault on Aleppo, Syria’s largest city. “Russia and the regime owe the world more than an explanation about why they keep hitting hospitals and medical facilities, and children and women,” Kerry told reporters alongside French Foreign Minister Jean-Marc Ayrault, who arrived in Washington directly from meeting Russian officials in Moscow. 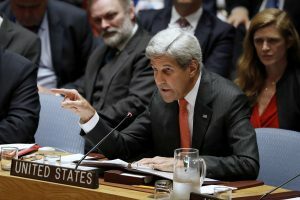 The Russian Foreign Ministry said Kerry was trying to divert attention from America’s failure to uphold a cease-fire in Syria. The U.S. has little chance of being able to initiate a war crimes probe of either Russia or Syria. Russia has veto power at the U.N. Security Council and has blocked repeated attempts over the last 5½ years to put pressure on Syrian President Bashar Assad’s government or hold it accountable for the widespread allegations of indiscriminate killing, torture and chemical weapons attacks. Ayrault spoke of a new French effort for a cease-fire in Syria that would include a U.N. Security Council vote on Saturday. But it’s unclear what advantages his plan would have over the U.S.-Russian led process that collapsed last month. Kerry’s Sept. 9 agreement with Russian Foreign Minister Sergey Lavrov would have created a new counterterrorism alliance in Syria, had fighting stopped for a week and aid deliveries been permitted to reach desperate civilians in rebel-held parts of Aleppo and other besieged areas. Neither condition was ever met. The truce then shattered completely when Syria and Russia renewed their military offensive in Aleppo. Kerry ended bilateral discussions with Russia on the military partnership earlier this week. Speaking in English, Ayrault called Syria a “human tragedy” that demands every effort to restart a peace negotiation. Russia will almost surely veto the French measure. “I cannot possibly see how we can let this resolution pass,” Russia’s U.N. Ambassador Vitaly Churkin told reporters Friday. The war has killed as many as a half-million people since 2011, contributed to Europe’s worst refugee crisis since World War II and allowed the Islamic State group to carve out territory for itself and emerge as a global terror threat. Given the range of militant groups, extremists and outside powers now fighting in Syria, the original contest between Assad’s government and so-called “moderate” opposition forces has proven stubbornly difficult to quell. Russia launched its air campaign in Syria a year ago, reversing the tide of war and helping Assad’s forces make significant territorial gains. Washington responded by engaging Moscow in a multinational process aimed at getting all of Syria’s fighting parties, except the Islamic State and al-Qaida, to buy into a cease-fire and eventual unity government. The U.S. also wanted Russia to join in the campaign against extremist groups like the Islamic State. For that reason, Kerry and other U.S. officials have tempered their criticism of Russia even as the death toll from its air campaign has risen. Syrian human rights observers claim Moscow has killed as many as 9,400 people, crushing hospitals, schools and other civilian infrastructure in rebel-held areas along the way. But by calling for the investigation, Kerry risks further shutting the door on diplomacy. Russia will likely be angered. And the Pentagon, which opposed plans for the proposed military partnership with Moscow, will likely find it even harder to contemplate cooperation with a government the U.S. is publicly accusing of war crimes. Russia, meanwhile, appears to be plowing ahead with its long-term strategy for Syria. As Kerry and Ayrault spoke at the State Department, Russia’s lower house of parliament ratified a new treaty with Syria that would allow Russia’s military to remain indefinitely in the Arab country. The vote was unanimous.